Flying Eye Books, 9781911171881, 88pp. The year is 1927, and in America, England and Russia, three young girls share the dream of becoming pilots. Against the odds, these ambitious young trailblazers follow their hearts, enrolling in pilot school (some in secret) and eventually flying for their countries in World War II. Follow the adventures of these young female pioneers as they battle not only enemies in the skies but sexism and inequality in their own teams, and encounter legends like Jackie "Speed Queen" Cochran. 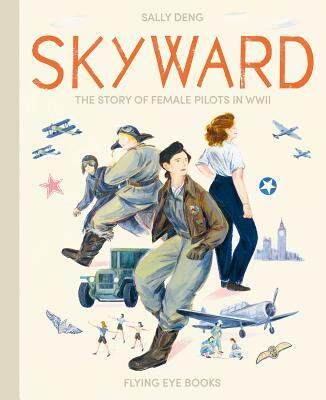 Risking their lives countless times in feats of incredible bravery, the Women Airforce Service Pilots--WASPs--of the Second World War are honored in this beautiful story based on actual events, illustrated in Sally Deng's raw, dynamic style. Sally Deng is an artist based in Los Angeles. She recently graduated from the Art Center College of Design in Pasadena with a BFA, and has exhibited widely in both solo and group shows in California, Illinois and Texas. She won the American Illustration Award in 2016 and 2017.